I chose the name "Mighty Small Things" for this blog because it has reference to one of my favorite scriptures, "...by small and simple things are great things brought to pass..." This is how I have seen the Lord working in my life. It is in the small things, the small acts, the small miracles that have built my faith into something mighty. He makes small things mighty. That is the power of the atonement working miracles in our lives. It is through the daily, sometimes hourly things that the Lord uses to bring about His mighty works. I am so grateful the Lord uses small things to bring about His mighty purposes. I am small, but He is Mighty. As I blog, I hope to create a bond of friendship with my readers. So, by way of introduction, I will share a little about me, so that we can get to know each other. My name is Jenae. That handsome man in the picture above is the love of my life. That is a picture from our dating days. 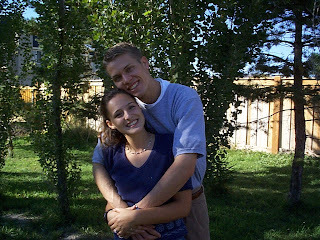 I say "days" because we only dated for 3 months before we got married! When you know it's right, there's no reason to hesitate (story of my life!) He served a mission for the Church of Jesus Christ of Latter-day Saints in Brazil for two years. There he met and served with, we'll call him Paul, one of his mission companions. After returning home he went to Paul's wedding who just happened to be marrying my cousin (whom I lived with for a time and was more like a sister to me.) I was the Maid of Honor and he was the Best Man. And just like that, Divine Design smiled down upon us. Now, 12 years later, we are still in love and have four amazing children. I can claim the status of a retired personal trainer...although it was more of a job change than retirement. Prior to that change, I felt that God wanted me to help others on their path to a healthy life, and it was something that brought me a great deal of joy and satisfaction. In July of 2012, I felt the Lord's gentle and inspired guidance once again, this time to completely walk away from that endeavor so that He could better use me for other things. I have found every time the Lord asks us to walk away from something we love, He has something much better in store for us. And that has certainly been the case for me. Because of my history as a trainer, and many other reasons, health is important to me. Mental and physical. Taking care of the temple that God gave me is important to me. Beautifying and organizing my home is something I love to do. I love magnifying my calling of motherhood and homemaker. I am learning (in most cases for the first time) how to sew, cook, garden, can foods and perform other domestic duties. However, I am not into fluff or excess. I feel a home filled with the spirit of the Lord is more important than a home filled with beautiful things. I am working on increasing the portion of the spirit in my home. To me there is nothing more refreshing than a bright, beautiful day hiking in the mountains. I am rejuvenated when I am surrounded by God's creations. I love the earth. I am part Native American (my grandfather is a native Ojibwa.) I believe that has contributed to my deep love for nature and survival. I want to be an urban homesteader. Just not one of those crazy homesteaders who make their own toilet paper and don't wear make-up...at least not yet anyway! Part of this blog will chronicle my transition into living a more simplistic, back to the soil lifestyle...one small step of the way. I was raised by a wonderful single mother, and at the pivotal age of 16, I met my dad for the first time in my life. I could write a book on that miraculous event. In fact, that is one of my working projects. I live with depression and anxiety and ADD. It doesn't define me, but it's real and I fight the daily battle to not let negative emotions rule my life. The ADD will be evident in my writing, and for that I apologize in advance (my mantra: I promise it all ties in!) I also have some health issues that I have dealt with over the years (I will write about this later.) I don't divulge this all for sympathy, in fact, I'd rather sweep it all under the rug and pretend that I have it all together. But who really does, right? More importantly, so many miracles have come from my trials and hardships, that in order to share the miracles, I have to share the hardships. My trials have brought me to Christ. And that makes me so very grateful. I thank my Father in Heaven for my life. I thank Him for the hard things. I thank Him for the abundance of really good things. I thank Him for even the small things. Through it all He has manifested His mighty hand in my life. I'm seriously so blessed and grateful to have a friend like you. I loved reading this about you. Steph, you're so sweet! I feel the same about you!